After the 2011 Tohoku earthquake and tsunami Japan shut down all of its nuclear reactors and set regional energy reduction targets to help meet energy demands without having to increase generating capacity. No one seems to be taking this heightened awareness of energy efficiency and renewable energy more seriously than the Shimizu Corporation, a large architecture, engineering and construction firm based in Tokyo. On August 1, they opened their new headquarters – which is touted to be the least carbon-emitting building in the world. 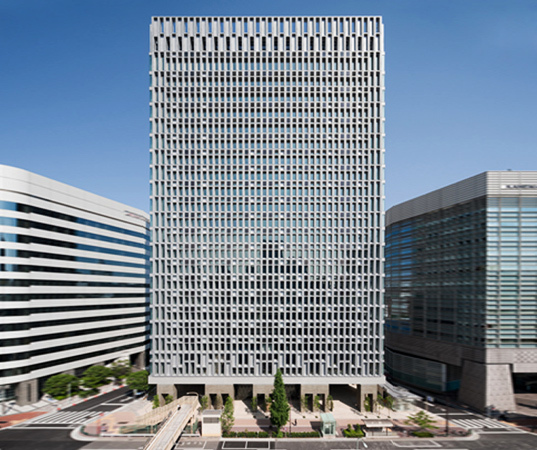 The Shimizu Corporation headquarters is projected to emit only 25 pounds per square foot of CO2 per year, which is 62% less than a typical Tokyo office building. One major energy-efficiency strategy that contributes to this reduction is the building’s innovative HVAC system, which utilizes water hoses in the ceiling panels. Water in hoses set above the ceiling panels is kept at a temperature of 68 degrees, so when heat produced by people and equipment below rises to the ceiling, it’s automatically cooled, and the cool air sinks cooling the space that people occupy. This convective HVAC system alone reduces carbon emissions by 30% compared to buildings with conventional HVAC systems. 6500 square feet of solar photovoltaic panels on the exterior of the building are set to produce 84,000 kilowatt-hours a year – enough to power the building’s daytime lighting needs. The building also sports a smart façade with motorized shading devices that automatically adjust to shade the building from unwanted thermal heat gain while still letting natural daylight in. These strategies, along with the use of LED lighting and occupancy sensors reduce the headquarters’ lighting CO2 emissions by a whopping 90% compared to buildings with conventional lighting. 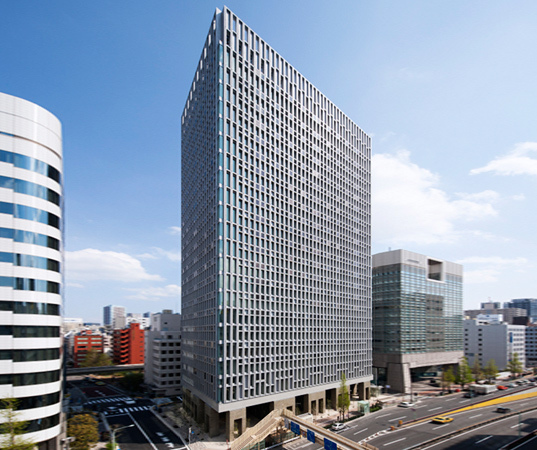 By 2015, Shimizu plans to reduce its headquarter’s carbon emissions by 70% by refining their energy-saving strategies, and the company eventually plans to make the building zero-emissions by purchasing carbon offsets. Their commitment to carbon reduction not only shows a sensitivity to Japan’s lack of natural resources and recent energy crisis, but it also serves to demonstrate to potential clients in Japan and all over the world what Shimizu is capable of doing in green building. This multiple benefit very much fits into the company’s “Rongo to Soroban” mission which promotes the balance between ethical humanism and economic gain. Thanks for your comment @kobrienemerge. Yes, I think we should look to Japan for lots of innovative green building strategies in their new era of energy efficiency and renewable energy after their energy crisis. After the 2011 Tohoku earthquake and tsunami Japan shut down all of its nuclear reactors and set regional energy reduction targets to help meet energy demands without having to increase generating capacity. No one seems to be taking this heightened awareness of energy efficiency and renewable energy more seriously than the Shimizu Corporation, a large architecture, engineering and construction firm based in Tokyo. On August 1, they opened their new headquarters - which is touted to be the least carbon-emitting building in the world.